THERE'S “no chance” of a free trade deal between America and Britain if there's a risk of a post-Brexit hard border in Ireland a US Senator has said. 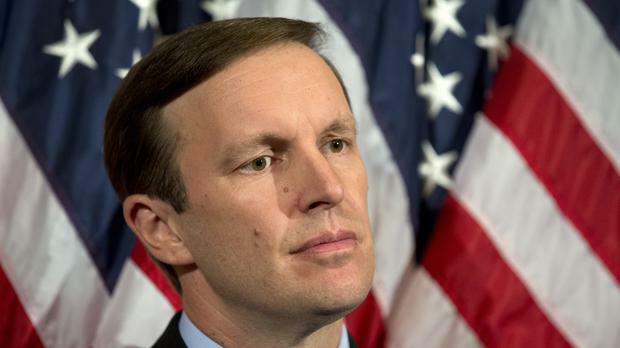 Senator Chris Murphy also hit out at US President Donald Trump claiming he doesn't understand international trade and pointing out that Congress has the “final say” on such deals. Meanwhile, he also said there's “no excuse” for the post of US ambassador to Ireland being unfilled for more than two years. Mr Murphy made the remarks at the end of a visit to London, Belfast and Dublin. Last week Mr Trump tweeted about how his administration looked forward to negotiating a “large-scale trade deal” with the UK. It came hours before his meeting with Taoiseach Leo Varadkar in the White House. Mr Varadkar's attempt to promote the possibility of a free trade deal between the US and EU prompted a tirade from Mr Trump who complained about America's treatment in negotiations with Europe in the past. Mr Murphy, a Democratic senator from Connecticut, is a member of the powerful Senate Foreign Relations Committee. He said the US Congress is “waking up” to the potential consequences of Brexit to the peace process in Ireland. He said: “I think there is very little chance there is going to be US-Britain free trade agreement. He argued that the Trump administration has “way over-sold the ability” for the US to do a free trade deal with the UK. He also said: “I wish that the President wasn't such an unconditional cheerleader of Brexit. I wish he personally was making it clear that the peace process has to be fully, 100pc protected. Mr Murphy said that he'd prefer to see a free trade deal between the US and EU prioritised over one with Britain. “I think there's a growing worry in the United States Congress about the long-term stability of the European Union and Nato given Russia's constant attacks on both. “Part of the reason why I want to see us get back to the table on an EU trade agreement before we negotiate a Britain agreement is that we should show preference to multilateral institutions above bilateral agreements. Mr Trump last year nominated billionaire Ed Crawford to be the next ambassador to Ireland but he must be approved by the Senate. He said Mr Crawford's application was just submitted to the committee last week and he hasn't looked at it yet. He said he's supported other ambassadors put forward by Mr Trump that he disagrees with politically. “The President deserves to have his people in posts overseas. “So I'm not going to be looking at Crawford based on his political views. “I'm happy to get somebody over here who's an ally of the President.